Location: The Ice House, Newark Delaware. Monty’s Pythons: (Confident, Trained) "Monty’s Pythons", the 2nd Squadron, 12th "Three Rivers” Regiment, 1st Canadian Armoured Brigade, Currently TAD, Temporarily Assigned Duty, to the American 4th Armored Division. 7 Sherman’s, 2 with command and 5 in a single Platoon. 1 Recon Platoon of 3 Stuarts, 1 section of 2 M-10 Tank Destroyers, one Recon Platoon of 4 teams. 2 Batteries of 3 Priests. Led by Major General Harmon. Mission: Hasty Attack, Soviets are receiving. 3 objectives are placed, one is removed by the attacker after deployment. Attacker wins if the objective is taken, defender wins after turn 6 if there are no attackers on the defensive side of the board. 4 by 6 feet. A large hill (slow going) dominates the "left" side of the board. There is road running connecting the long edges of the board running along the hill, with several buildings along it. While a long creek runs almost center line from right side for about 3.5 feet. 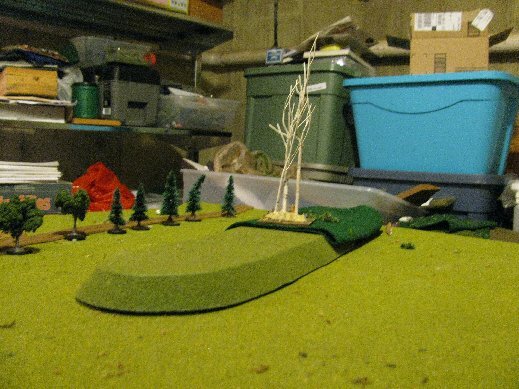 Woods are liberally scattered over the playing field. In addition, the two main tree lines visible are also sitting on large hills and classified as slow going. 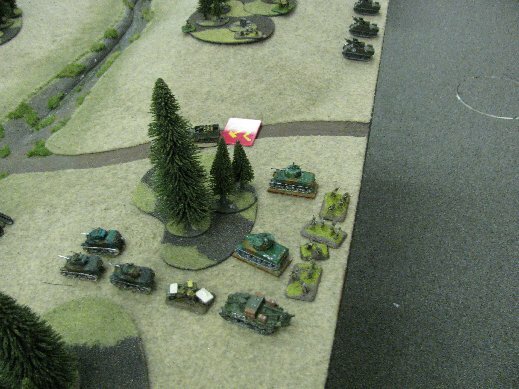 The Soviets start with half their forces on the board. 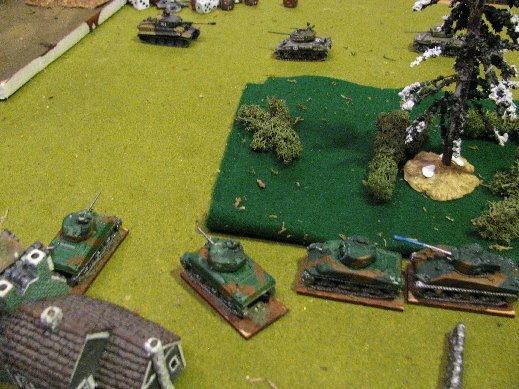 He placed the T-34 Platoon in a woods between two objectives. 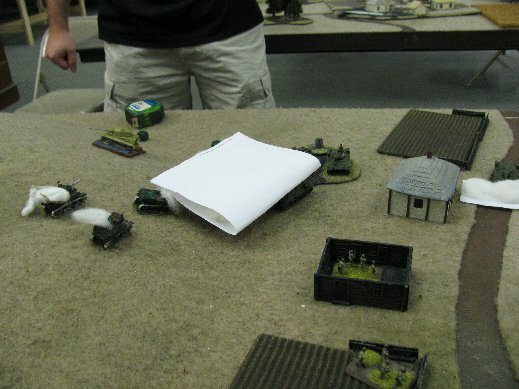 A single Razvedki Platoon covered two objectives as well. 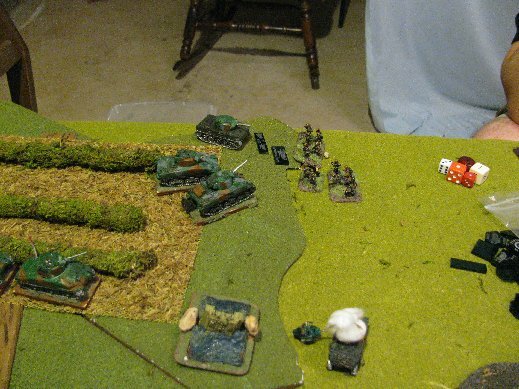 The Platoon of SU-85’s was on the reverse side of a ridge in immediate ambush awaiting orders to move out. The Americans started with one Battery of Priests, deployed reverse side of a ridge of a hill. 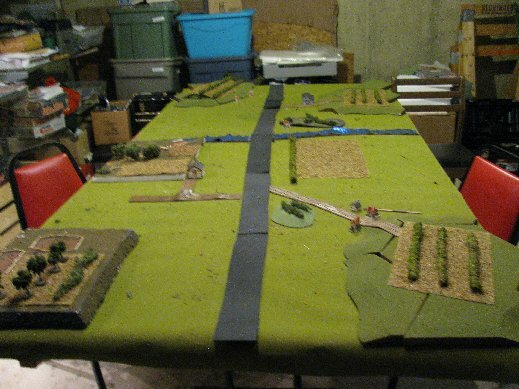 The Stuarts were set up to run along the large left side hill, while the Reconnaissance Platoon was deployed on the road. American Deployment, 3 Stuarts followed by General Harmon. Two staff tanks. Priest battery in the upper frame. The infantry teams are actually embarked on the jeeps and half-tracks obscured by the trees. 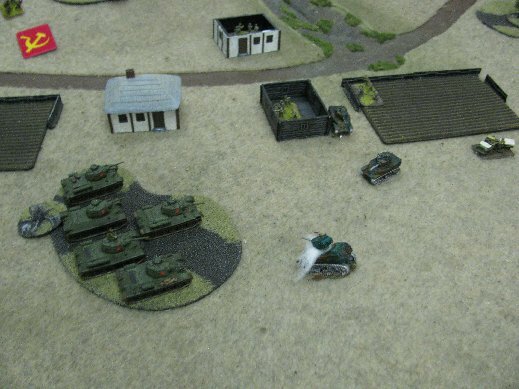 Soviet Razvedki Platoon deployed covering 2 objectives, one of which was removed. 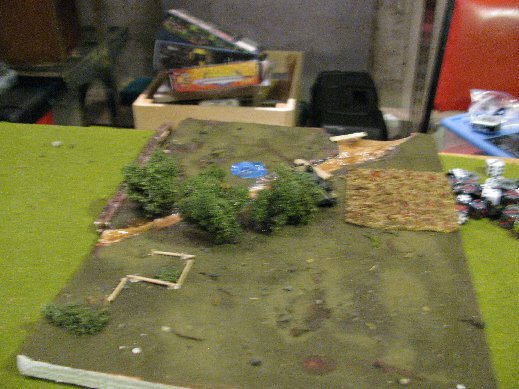 While the T-34's hide in the woods near the other objective. The SU-85's were in immediate ambush and haven't deployed yet. Up to now, I have tried to have the Monty’s Python’s Battle Reports have a reasonably accurate historical reference to write against. That is not going to happen here. I could invent some contrivance of an accidental encounter in Mid-1945, or claiming some odd German unit with captured Soviet equipment. But that would be boring and tedious. We’ll go with the George Orwell concept of, the enemy is Russia, the enemy has always been Russia. Also, for this tournament I have opted to play the Americans vice the Canadians. I have found that the main advantages of the Canadian armor, that of Semi Indirect Fire, is not conducive to tournament play. It just takes too long. 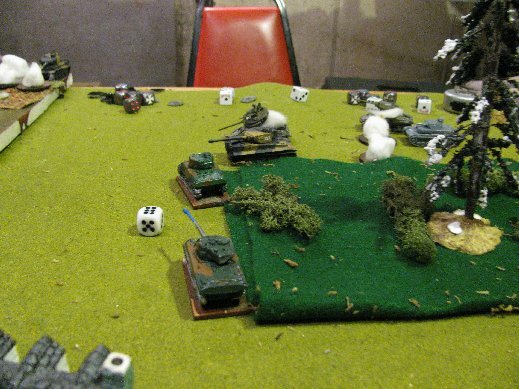 While the Stabilizers of the American Army are conducive to tournament play. 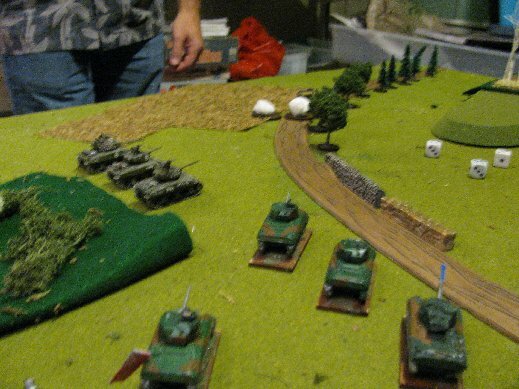 So Monty’s Pythons have been temporarily assigned (TAD) to the American 4th Armored division. Captain Palen began the briefing, "And now for something completely different. 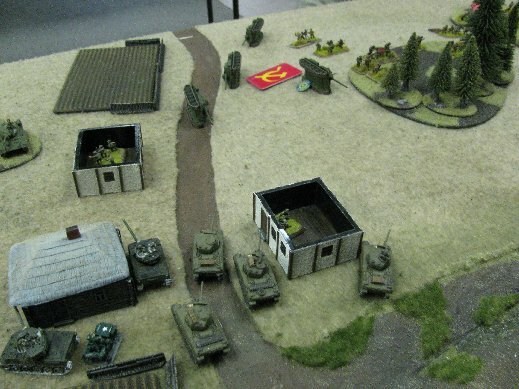 Our scouts have just hit a Soviet blocking force, and we need to remove it before they get a chance at reinforcements." “Say no more.” replied Lieutenant Idle. My thought here was to go for a quick win. Take advantage of the high speed of the Stuarts, and the jeeps on the road, and use General Harmon’s ability to push another 4 inches of movement, to take the left most objective, while bombarding the T-34’s with smoke to keep their shots at minimal effectiveness. Part of the plan went bad immediately, as I realized that the General Harmon didn’t move during the Reconnaissance move and so was too far behind to lend aid to the Reconnaissance teams. The other Reconnaissance team, moved at full speed up to the buildings. 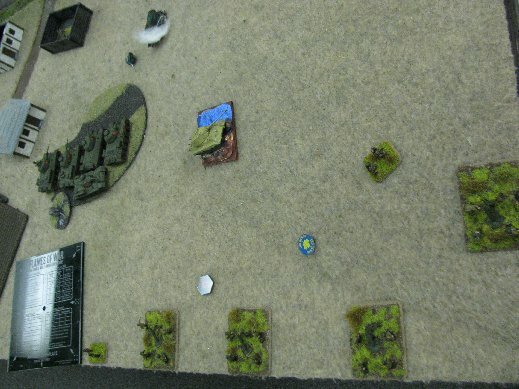 And so it was, the Stuarts were about 2 inches short of the objective at the end of turn 1. The other Reconnaissance team, dismounted, and entered the buildings. General Harmon raced up the same road in case he was needed. Lieutenant Jones, "Who's that then?" Lieutenant Cleese, "Must be a General." Lieutenant Cleese, "He hasn't got crap all over him." This was where my plan fell apart. 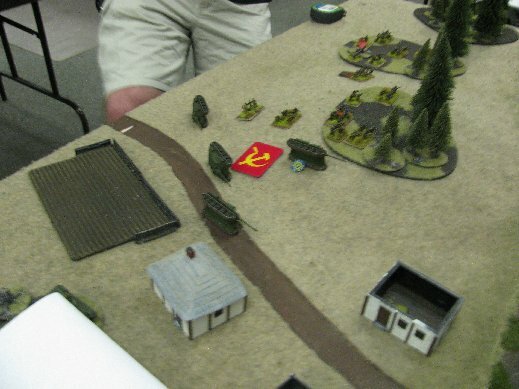 The Soviet player was not coming out of the woods. So could only be spotted from 6 inches away. 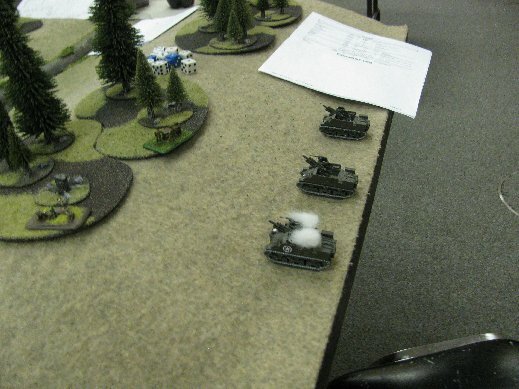 My platoon leaders were both within 6”, but both had moved, and so couldn’t spot for the artillery. So much for smoking the T-34’s in. What’s that buzzing noise? Is it a bird? is it a plane? Oh, it’s a plane. A Soviet biplane, used mainly for night time harassment. It didn’t so much as attack as hovered over the Priest Battery. Moving so slow, that the AA gunners, used to leading the target, all missed. The pilot drifted by, flipping both the bird and a Molotov cocktail out of the cockpit, setting fire to the Priest Gun #1. First Stuart flamed. Sergeant Gumby's Recon team is dismounted in the buildings. Priest Gun Number 1, killed by air strike. I successfully rolled reserves, and decided to bring in the other battery of priests. When my Shemans charge up the road, I want plenty of support. 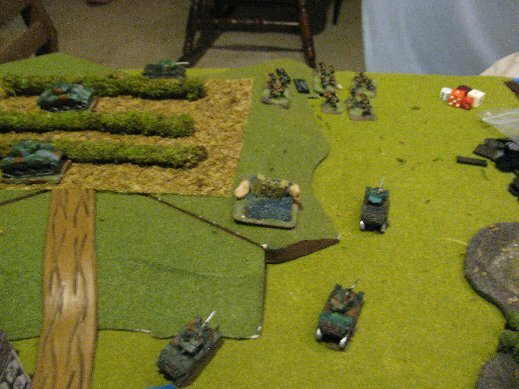 The only visible target for the artillery at this point is the Soviet Infantry, so I gave them a barrage and pinned them. Command Shermans gingerly step out. 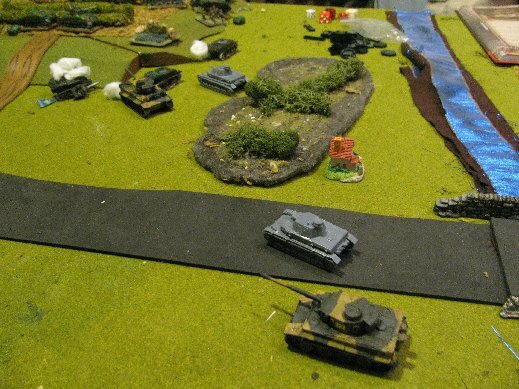 Soviet T-34's come to edge of the woods and destroy the recon Stuarts. Once again, Lieutenant Idle is faced with the choice of death or dishonor, and chooses dishonor, taking General Harmon with him. Americans rolled reserves and brought in the platoon of 5 Shermans. 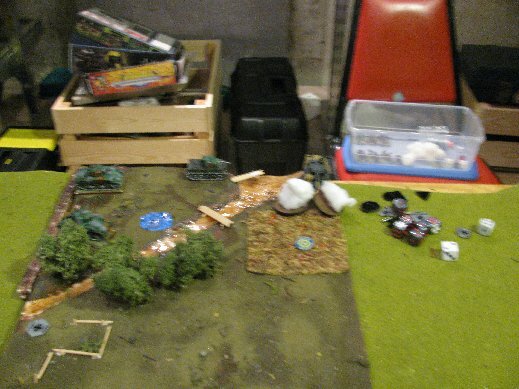 Poorly photographed, but revealing the SU-85's have taken some artillery fire, killing one, bailing another, this was then followed up by direct fire smoke from the command team. 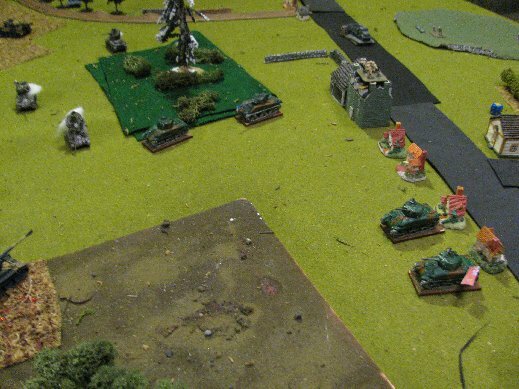 While the short Priest Battery smokes the T-34's. 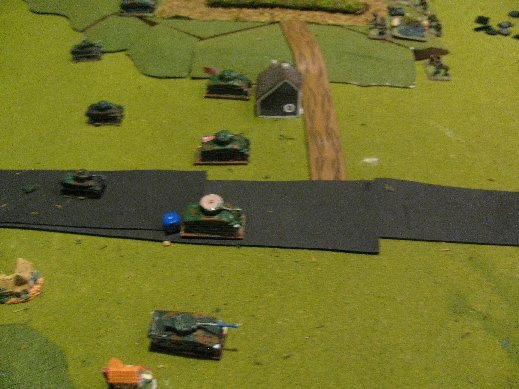 The Shermans roared up the road, firing with stabilizers and picked up the SU-85's. The reserve Tank Destroyer Platoons also rolled in with their jeeps roaring 24 inches up the road. 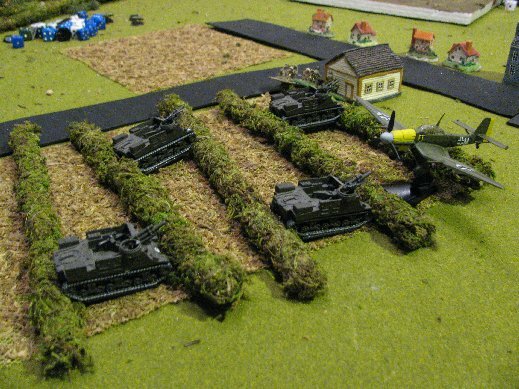 In response the Soviets retreat their T-34's into the woods where they can't be seen. This is novel, after fighting Tigers and Panthers, to have tanks actually retreating from my Shermans. "Karl Marx, you may know your proletariat from your bourgeoisie, but do you know who won the cup final in 1939?" screamed Lieutenant Gilliam. Off in the distance, between the explosions of the guns, was heard a faint, "The workers' control of the means of production? The struggle of the urban proletariat?" "No you stupid git, it was Portsmouth over Wembley 4-1!" 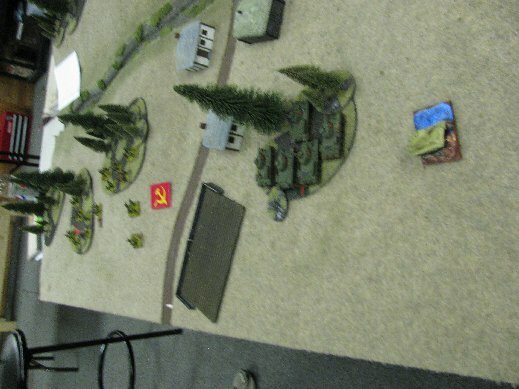 Soviet reserves rolled on, near the objective I planned to take. Its the Mortar Platoon. With the SU-85's gone, I am going to switch my Shermans to the left most objective. To that end I gave the mortars a barrage, killing 2 teams. I sneaked the Recon Platoon commander from one building to the one closest to the woods for a spotting effort. Now what was I thinking? To put the a single spotter 6 inches away from no less than 3 tanks that could shoot him. 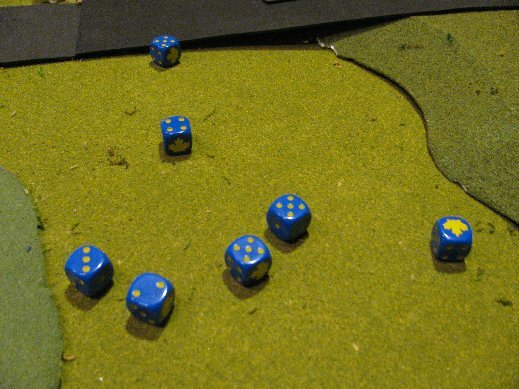 21 dice later and all I could think of was he had a lucky cigarette case that could stop 7.6cm rounds, because every shot missed! 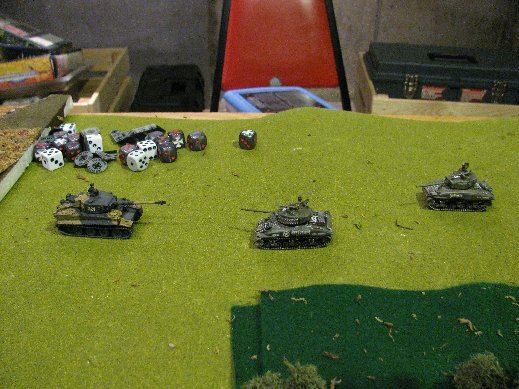 Command Teams charging on the left, 1st Tank Platoon on the right. 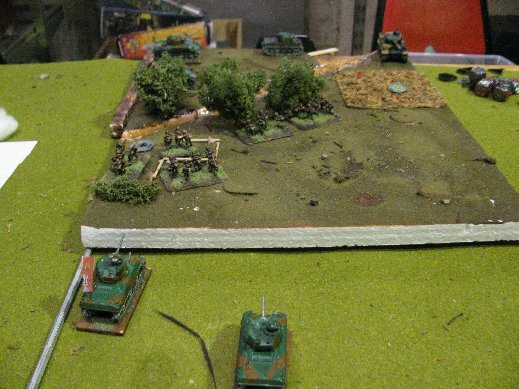 The Shermans shift targets to the center objective, approach, shoot and charge, but are repulsed on the counterattack. 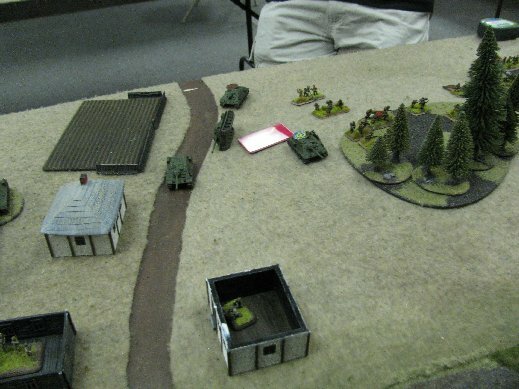 Next turn would be 4 tanks verses 2 infantry teams for the objective, but the game was called on time. Making this a Soviet victory. End Game called on time. 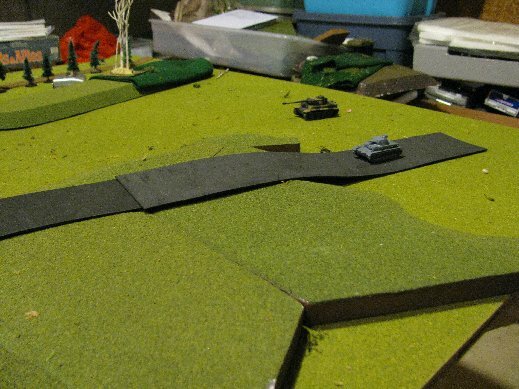 Shermans shift targets to the center objective, as I can move faster, off the hills. This should have been an easy fight against 3 infantry teams. Tank Destroyers covering the T-34's should they show themselves. Know your enemy. This was the first time I faced a Soviet Army, and while I knew some of the restrictions on them I was not aware of them all. Also, my play has been influenced by playing against Tigers and Panthers. To have an opponent that was retreating before my Shermans was a novelty. Don't use a high command to save a 1 element platoon unless there is an overriding imperative to do so. It's not worth a 50/50 shot. Had the last tank in the recon platoon been sitting on the objective, then it would have been worth while. Plus, The Soviet Commander, Marcus wound up coming in second in the tournament, so having a close loss against the next best player of the day isn't to bad. 10 Shermans, in 2 Troops of 3 tanks each. 1 recon Troop of 3 Stuarts, One battery of 4 Priests, lead by Brigadier “Pip” Roberts <queue fanfare>. German (Confident, Veteran) 1st Kompanie, 501st Schwere Panzerabteilung. 3 Tigers, 2 Panzer III(n)’s in two Platoons, 1 Platoon 5 of Fallschirmjagers (Fearless Veteran), Air Support. Mission: Cauldron. Delayed Reserves, German side places two objectives. Winner is declared when any objective is held by the opposing side after turn 6. The main road is Jonica Highway, near the shoreline in the arch of the boot of Italy. A tree lined dirt road leads to scenic Canna. Winter seems to have come early here as the snow covered forest dominates the center of the map. Both sides started with half of their platoons on the board. 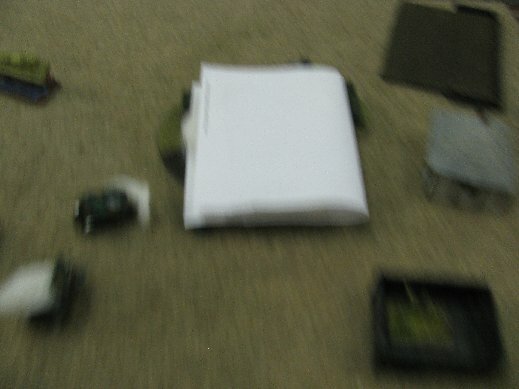 I opted for the Priest Battery deployed in a large vineyard, and a Troop of Shermans near the center woods. 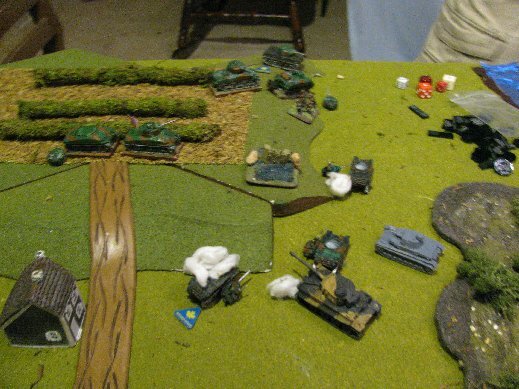 The German started with ony 1 Platoon, and deployed a Tiger and a Panzer III on the dirt road leading to Canna. 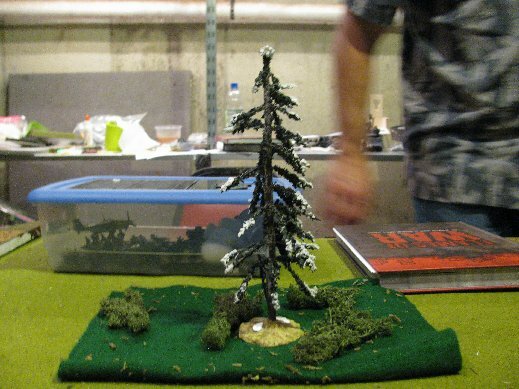 His CIC Tiger was deployed in the combined piece of terrain pictured below, on the edge of the board. General, “Pip” Roberts started the briefing. “Now thanks to the efforts of Bicycle Repairman." "Our hero!" chorused the company. Captain Palin stood up, “Now you may be asking yourselves why you have been issued these tank recognition flash cards. This is because the boffins at High Command has decided that we have not in fact been trading shots with a company of Tiger Tanks." He continued, "I quote. The unit you claim to have fought on September 12 and 13, 1943, cannot be the elements of the 501st Heavy Panzer Battalion, as that unit was destroyed in Tunisia. Intelligence assures us that there are no Tiger Tanks anywhere in the Italian Peninsula. The presented evidence of prisoners from that unit were simply escapees from the 501st that managed to swim across Mediterranean on telephone poles. The photographs presented are simply grainy images of swamp gas, and the piece of 4" thick armor plate bearing the number 501 was carried here by migrating fauna, probably sparrows. End quote." "So, from now on, when we see an enemy tank, the number one priority is to get an accurate ID of it. When you are being shot at by an enemy tank, you must first find the card that most closely matches what is shooting at you, then hunker down and start shooting back. Is that clear?" This grainy image is actually swamp gas, and does not show the I/501 Commander's Tiger Tank. 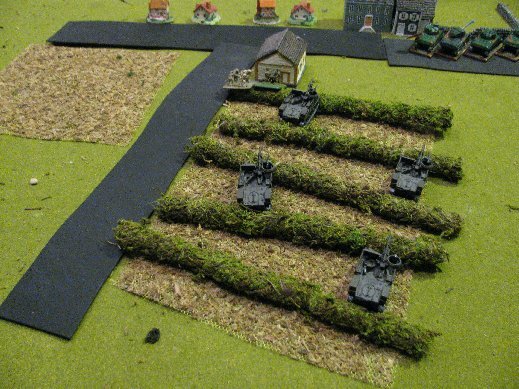 The single German Platoon deploys along the dirt road to Canna. Priests deployed in a vineyard, all more than 3 inches apart. The command team including General Pip Roberts <queue fanfare> is in the upper right. I tried to take advanatge of my numbers by swamping the German Platoon with only 1 Tiger and 1 Panzer III, while smoking the German CIC. 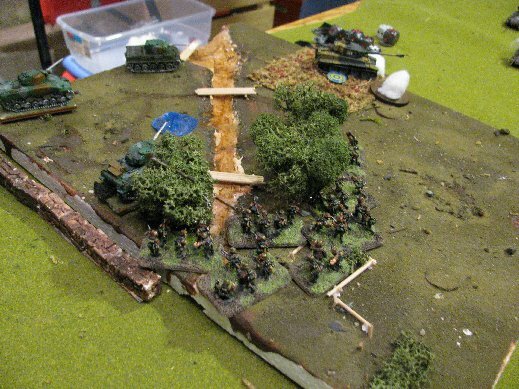 Troop 'A' moves out to charge the German tank platoon along the tree line. The command team will follow. Since there is no percentage in hitting the Tiger frontally, the Shermans smoke it instead. While the Priests fire smoke at the swamp gas. 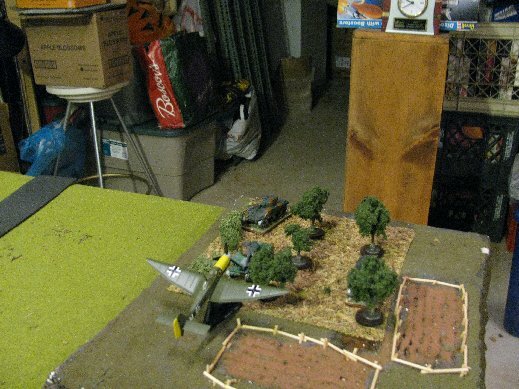 The Luftwaffe shows up, but can only get one target under the template, which they miss. 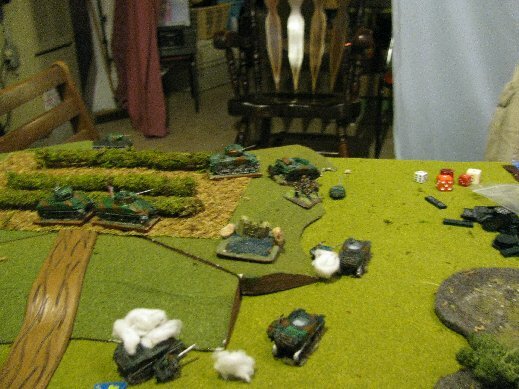 Troop 'A' had one Sherman killed, and I realized between the line of trees on one side and a "slow going" field on the other, I was never going to get the flank I needed to kill the Tiger, so I decided to switch targets against the German CIC instead. 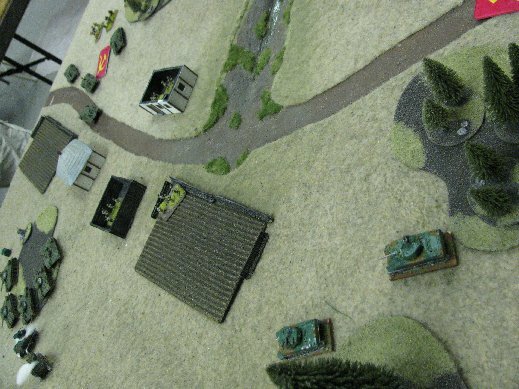 Troop 'A' charges the German CIC. While the command teams go for the flank. Another strafing run by the Luftwaffe. 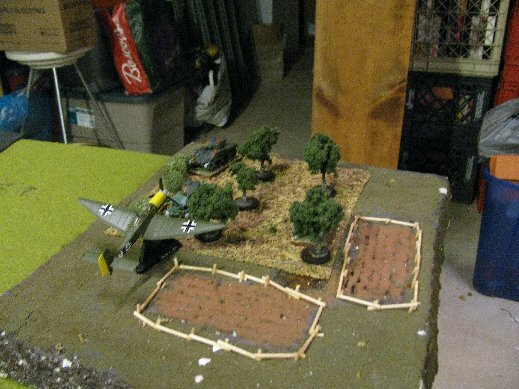 In what will become a game winning move, another German Platoon arrives from reserves. Despite the smoke, the Tigers had managed to destroy Troop 'A'. The German CIC retreated to a position to make its flanks unassailable. Quiet, Quiet, Quiet, Stealth, Stealth, Stealth. Troop 'B' arrives from reserves, 3 flank shots but no hits. The fearless Fallshrimjagers arrive from reserves. 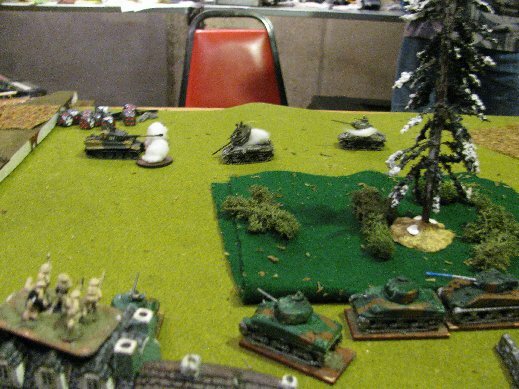 They sneak through the trees and take a Sherman completely by surprise! 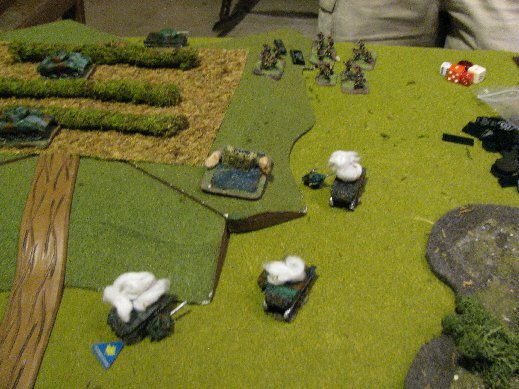 But while the target is surprised, his two troop mates are not, and get 7 shots on the assaulting Fallshrimjagers. Oh Canada! The Fallshrimjagers are pinned and fall back, two are killed. 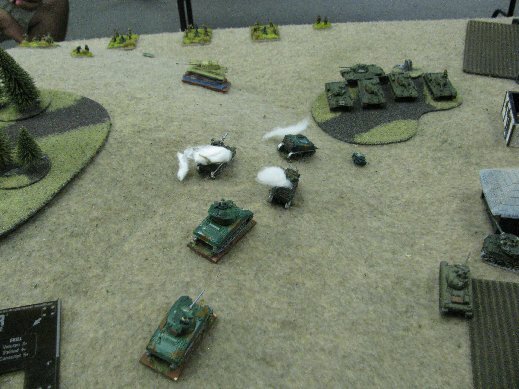 The first German Tank Platoon moves on unmolested. There are so many dead Shermans spewing smoke in front of him that adding more smoke wouldn't matter. 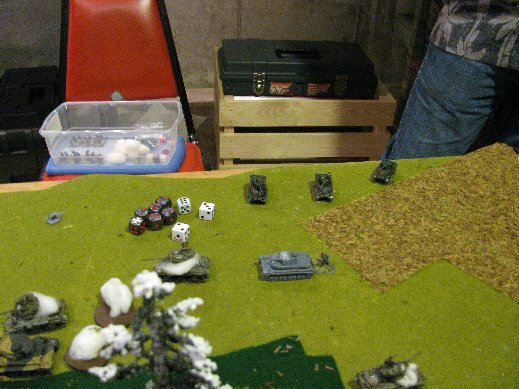 While the second German Panzer Platoon heads for the objective. Remember the objective? This game is about the objectives. 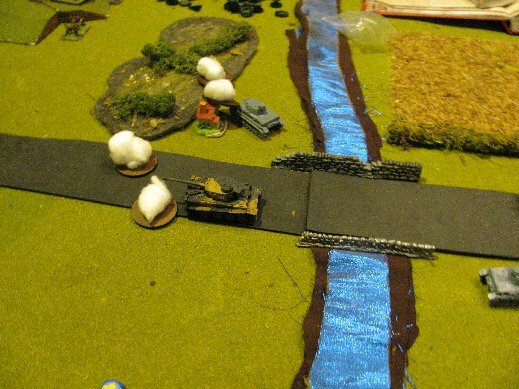 While Troop 'B' continues to fire at the German CIC, gaining only a bail, the command teams pick up the Fallshrimjagers. More smoke fired at the 1st German Panzer Platoon. And the bailed German Company Commander. The Luftwaffe makes another appearance to no effect. The last reserves arrive, Dennis Moore's Troop of Stuarts. 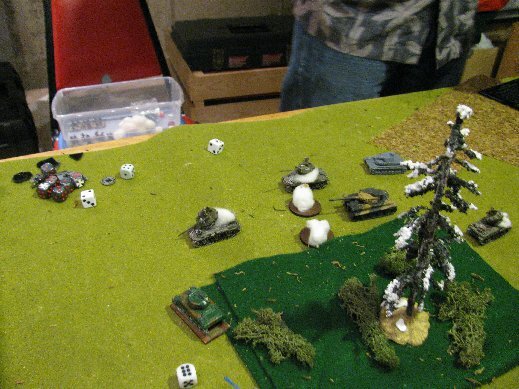 They line on the flank of the Panzer III, but fail to harm it. 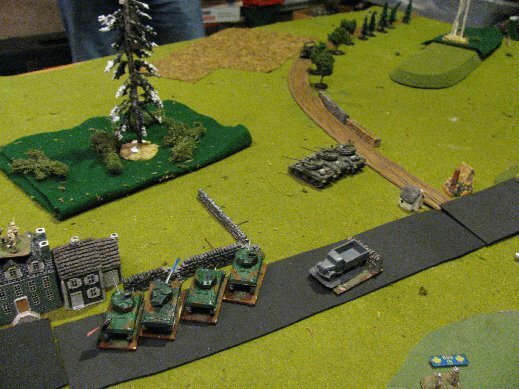 The German 1st Platoon peeks around the corner of the woods, and nails a Sherman. 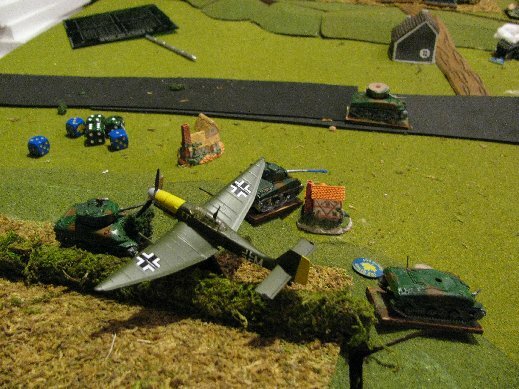 The Luftwaffe kills Captain Palen's Sherman. 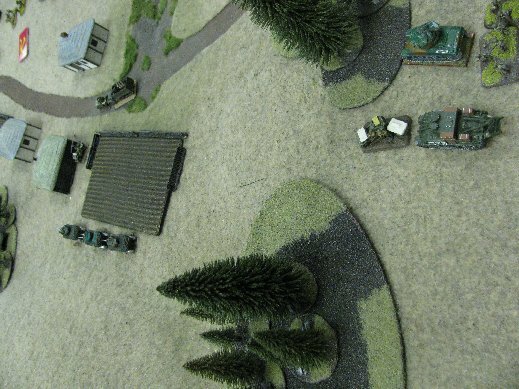 The German CIC, survives a double bail from the flank. 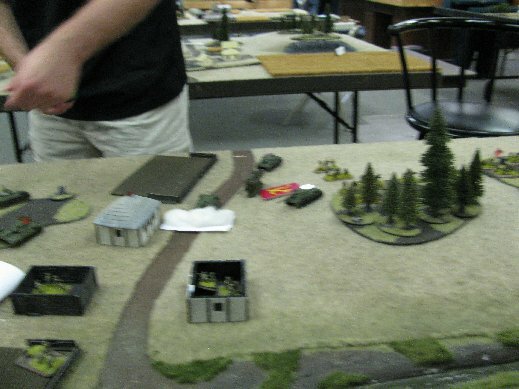 The German CIC remounts, retreats, and kills a Sherman. Wait a minute. We look at the clock and realize we are only an hour and 45 minutes into this game, and wasn't their a victory condition somewhere? Shuffle through the book. 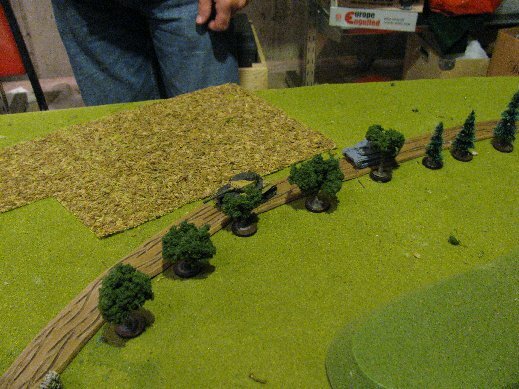 Oh, if the Germans are on the objective on turn 6, (they were) and the Canadians are not with 16" of the objective, (they weren't), then the swamp gas won! With this posting I will hit my 3,000 page view on this blog. Of course I owe this volume by tapping an insignificant percentage of the billions of page views from the WWPD site. But considering my other Blogs have no more than 110 page views, this is a heady number. I have a favor to ask. If you really like these missives, the format, humor, or lack thereof, the attempt at historical references, let me know once in a while. It's easier to stay motivated to write knowing someone appreciates it. Of course, if you are tired of Monty Python quotes taken out of context, mispelled german words, or I mix up which is Troop 'A' and 'B' in the missives, let me know also. I reedit these things all the time. 13 Shermans, in 3 Troops of 3 tanks each. 1 recon Troop of 3 Stuarts, lead by Brigadier “Pip” Roberts. German (Confident, Veteran) 1st Kompanie, 501st Schewere Panzerabteilung. For this round, we will be playing from the narrow edges of the board. The 1st Canadian is supporting Operation Slapstick, a quick run from the toe of the boot of Italy to the heel port of Taranto, which was offered to the Allies and invested by a sea landing by the 1st British Airborne Division. 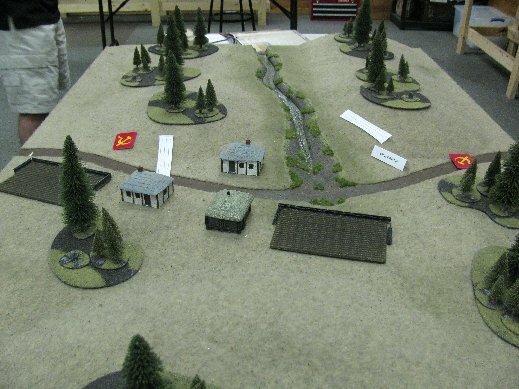 In their first encounter, the Canadians suckered the Germans out of position, and double timed their Reconnaissance Troop to the far objective, gaining a cheap win. 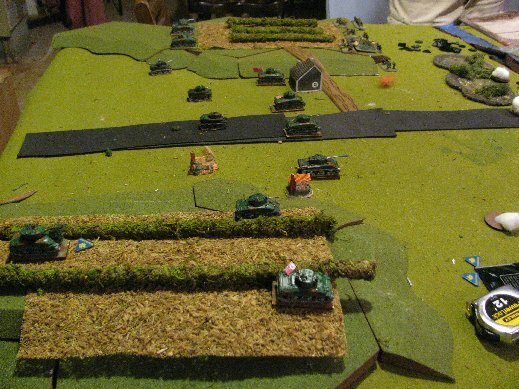 Now the problems start, as the undefeated Germans are now surrounded with clear visibility all round. Both sides started with all their platoons on board. The Germans occupied the area around the bridge of Via Giardini. The Canadians started with one Sherman Troop on right, the remaining forces on the left. For those who are not into the story, you could skip about a 1 page down to get to the proper Batrep. Brigadier General Pip Roberts took the podium. “Sir, Troop ‘D’ is absent, sir!” reported Captain Palin. “WHAT, Why?” roared Brigadier General Pip Roberts. Bovine IId Patty 5+ 1+ 7+ Teams hit make Motivation check or must exit the template. Troop 'A' took up the right flank hiding in an orchard. Visibility 16"
Troops 'B', 'C', and the Reconnaissance Troop started spread out over the left flank. 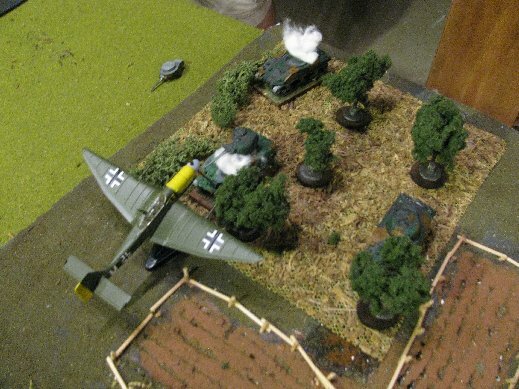 Liberally applying smoke to all Germans in range. Troop 'C' is in the foreground, Troop 'B' in the distance. The command staff and reconnaissance troop are in the center. 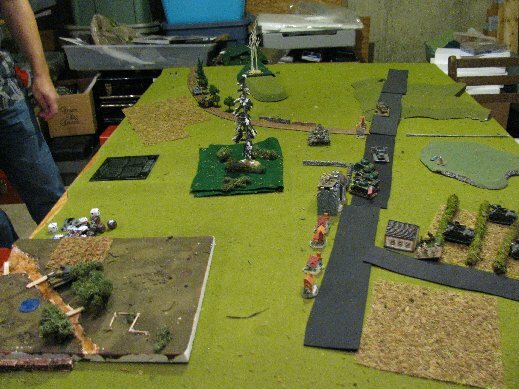 Turn 1 German deployment. Units on the left are smoked, not on fire. The Germans stand pat with no return fire. Orchards are not woods, so Troop 'A' is clearly visible to the Luftwaffe, which nails one Sherman. 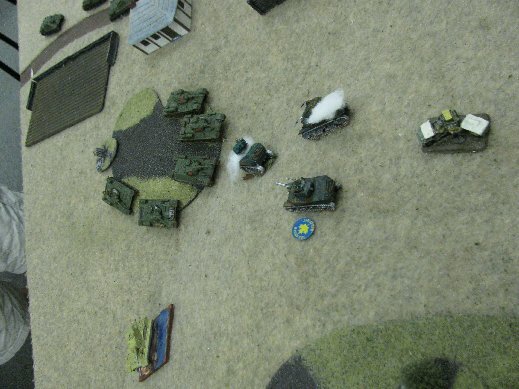 Monty's Pythons continue to advance, smoking the Germans as they go. 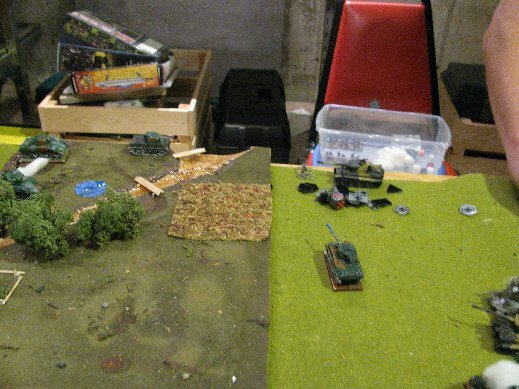 The near objective is defended by a 5 team Fallschirmjager platoon. That is where the hammer is going to fall. The Command staff and Recon troop continue to approach. The Fallschirmjagers, are in the upper left side. Not being seen is Troop 'B' in the vineyard. 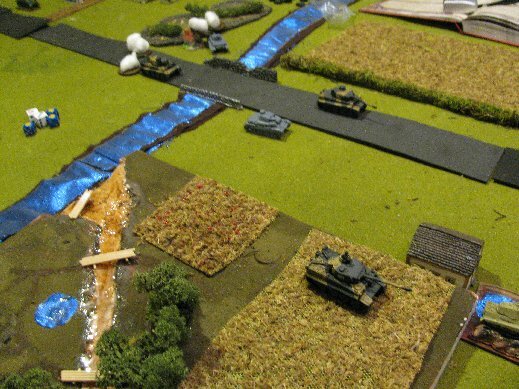 Troop 'C' is having issues, as one Sherman bogs, and the another bails from aircraft. 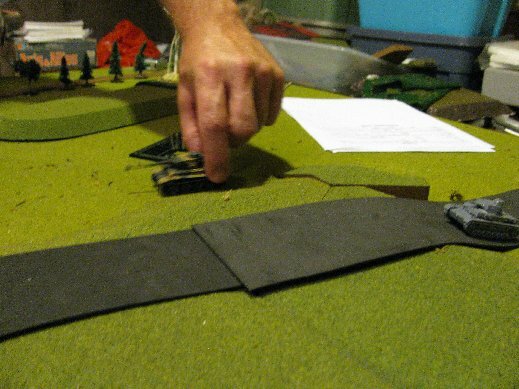 The Command Staff loses their expendable tank to an 88. Pounce! The Stuarts leap on a single team of the Fallschirmjagers, killing it, and forcing them to retreat, and securing the objective. 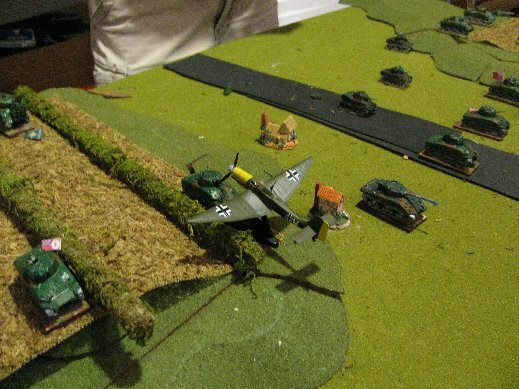 The Luftwaffe returns to Troop 'A', but with only one plane which rerolls hits, fail to score. But the Tigers are dynamite, and Lieutenant Idle riding "Sir Robin" did not get to "Bravely run away" this time. The objective is contested again. But Troop 'B' is now available to try again next turn. 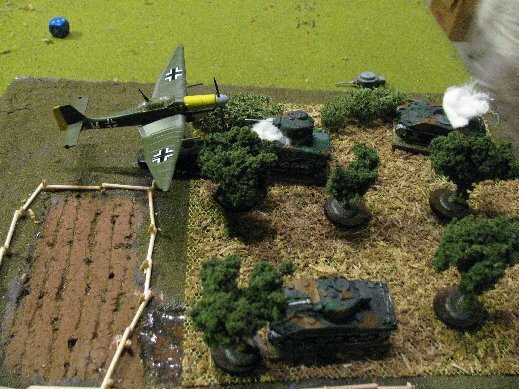 The Luftwaffe returns to Troop 'A' and picks off another Sherman. Being "Woodsman", the remaining tank perseveres and remains in place. 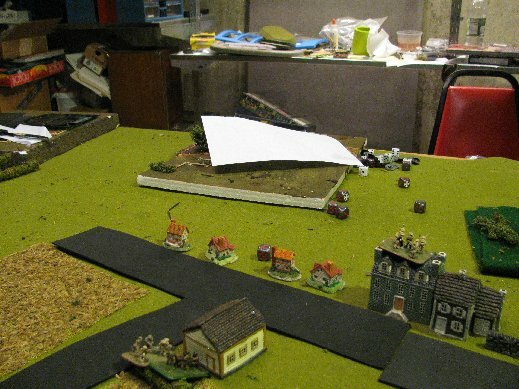 Troop 'B' shoots, killing 1, then assaults the Fallschirmjagers , killing another. The Fallschirmjagers pass motivation and counterattack. 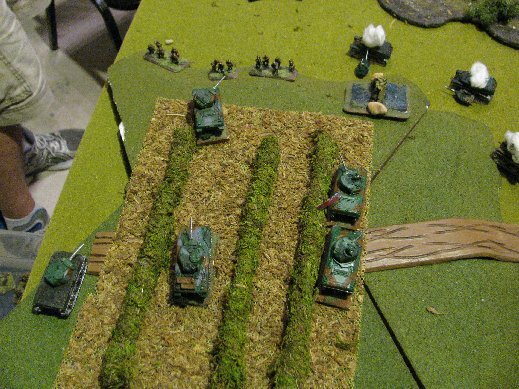 Having no antitank weapons, they score a hit, but fail to penetrate the armor of the Shermans. But it was enough, as Troop 'B' failed its motivation check, and retreats undamaged. 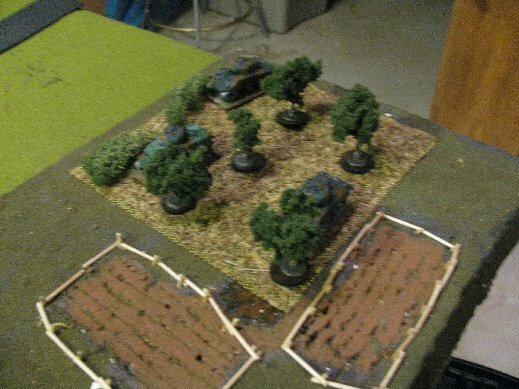 The Fallschirmjagers expand their position, contesting the objective again. 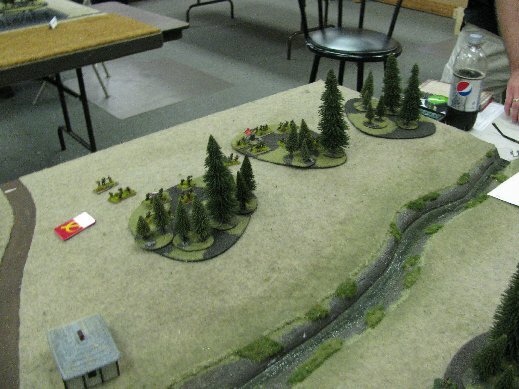 Troop 'B' shoots and assaults again. One Sherman bogs. 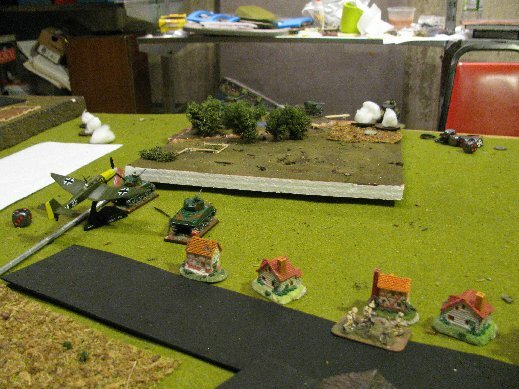 Once again, despite having no viable antitank weapons, the Fallschrimjagers pass motivation, while Troop 'B' fails. 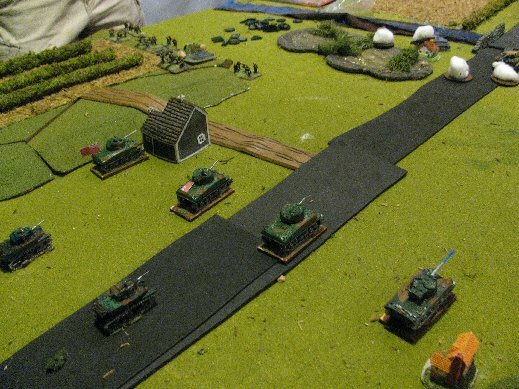 This time the last Fallschrimjager team captures a Sherman. Troop 'C' is not fairing much better. 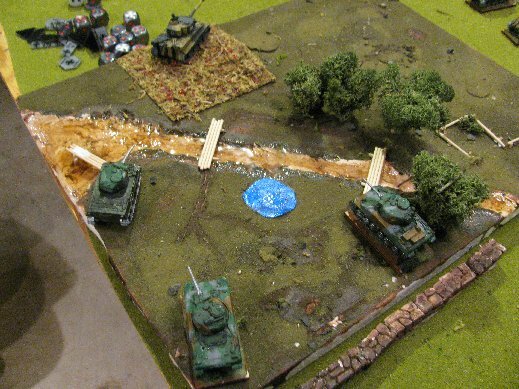 One Sherman bogged and remained so the rest of the game. (Its harvest time, and she looked so lonely stomping on those grapes by herself.) 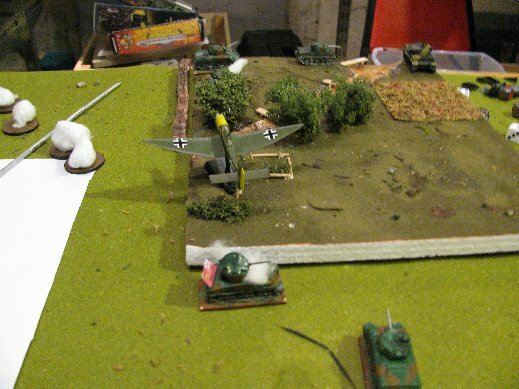 The Luftwaffe, in their 4th appearance, nails another Sherman. 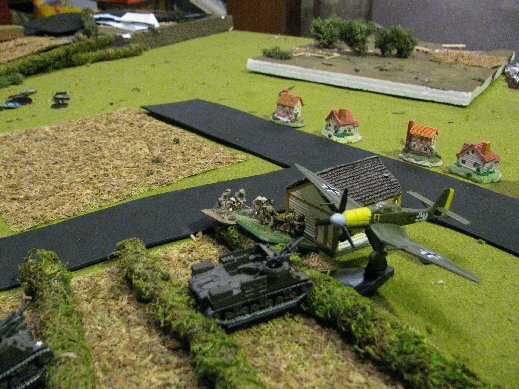 All the while, the Germans were advancing their Tigers, till they were now sitting on the objective. 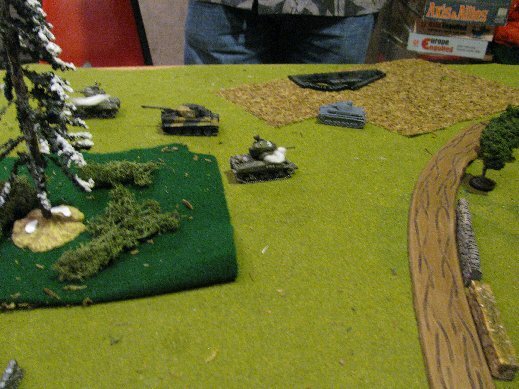 At this time, the Tiger to Sherman ratio was 3 - 4, and we called it a German win.